Internal Security Minister says police don't have evidence to try Jewish suspects, as lawyers complain investigation breaches law. "There are not many investigations that merit such high prioritization like the investigation of the murders that happened in the village of Duma, and still the general security services and police have advanced in this investigation," Erdan told Army Radio. "We are doing everything so that we will also have evidence to allow a trial and a submission of indictments," added the minister, admitting to an abject lack of evidence against the arrested youths. 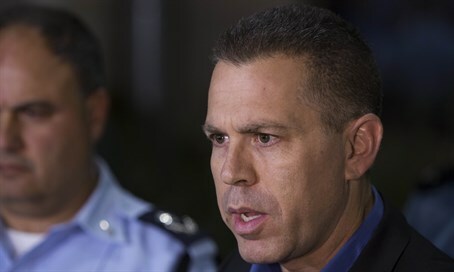 Erdan's comments come after Attorneys Adi Keidar, Chai Haber and Itamar Ben-Gvir held a press conference on Thursday night to complain about the "heavy-handed, violent" investigation that they argue has breached the basic rights of their clients. Keidar noted that the police admitted in court that they presented false figures in the initial arrest warrants, and despite that the court accepted what the attorney termed an attempt to make the legal defense "fail." ISA is trying to get "confessions by force," accused Haber, saying, "we receive indications of lengthy hours of interrogation, sometimes beyond what the law allows, detainment in substandard conditions, not giving required medical treatment, and not giving food in a fixed and appropriate manner." Ben-Gvir said his client was beaten and wounded in his arrest according to testimony by the suspect's wife, and noted with concern that the suspect was not brought to the court on Thursday in an apparent attempt to hide his medical condition. "We are not in Argentina!," he exclaimed. "It can't be that in the state of Israel they make people disappear in the basement of the general security services headquarters and no one opens their mouth." Criticism over the handling of the case gained steam after Defense Minister Moshe Ya'alon (Likud) publicly announced in September that the identities of the arsonists were known. However, just a month later in October, Prime Minister Binyamin Netanyahu admitted the arsonists - or even proof - in the case hadn't been found yet.